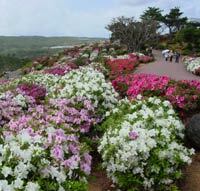 Fifty thousand azaleas are showing their colors in northern Okinawa. 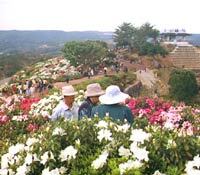 The Higashi Village Azalea Festival is in full swing, the colorful blossoms blanketing the mountainside, spectacular colors luring visitors. The festival, which began earlier this month, runs through next Wednesday. The festival is sponsored by the 2,000 local village residents. Higashi Village, situated in the Kunigami District on northern Okinawa’s east coast. The azalea bushes are everywhere in and around the village, with dozens of the perennial’s varieties on full display. Azaleas are often called “the royalty of the garden” because of their rich textures and vibrant yet delicate colors. A walk around the flower covered park in Higashi Village will provide super photo opportunities of the pink, purple and white flowers. 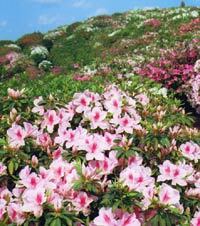 Even more azalea are dotting the landscape near the pineapple fields, on the mountainsides all the way to the ocean. Paved walking paths make it easy to soak up the horticultural delights afforded by the azaleas. Visitors walking through Higashi Village wend their way around the hills, and across a bridge between them. The festival offers a bit more than just the flowers, making it a fun excursion for the family. There are food vendors and game booths near the village entrance, and special events and demonstrations take place to involve visitors. A three-on-three basketball tournament takes place Saturday, and live Okinawa minyo‹folk songs‹performances are featured on Sunday. For those wanting even more, Higashi Village is a terrific place for picnic, and there are weekend canoe excursions on nearby Fukuchi River. The Fukuchi Dam is also nearby, as are camping areas and cottages for rent. Cottages have full kitchens, as well as barbeque grills. Both the festival grounds and camp sites are part of a Higashi Village-owned area known as Eco Park. Park admission is ¥200 for adults and students junior high school age and older, while elementary students pay ¥100. Pre-school students are admitted free. The drive is easy, albeit somewhat time consuming. The drive from Naha International Airport to Higashi Village takes about two hours, while the expressway is easier than the bus. Take the Okinawa Expressway, exiting at the Kyoda Interchange. From there, it’s about 40 minutes by car, with signs clearly marking the way. There are Express buses to Nago, after which passengers switch to local bus lines 73 or 78 to Taira, Higashi Village.